Keeps Cables, Wires And Cords In Place In A Non-Sticky Tunnel. This powerful tape adheres on the edges, not the centre area. Tunnel Tape's high-tack adhesive and durable cloth backing holds the cables firmly in place reducing the chances of tripping. 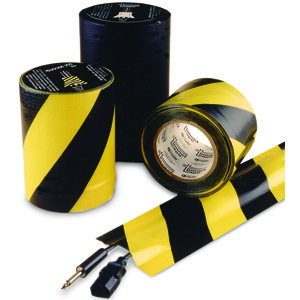 OSHA-compliant yellow and black stripped Tunnel Tape is available for safety applications. Applications include: taping down wires and cables in cention centres, auditoriums, stages and TV studios. Adhesive is zone coated on edges of hand tearable and puncture resistant cloth backing creating a non-adhesive tunnel for wires, cables, or cords to lay (pass) under. Removes easily from carpet and other surfaces without leaving a residue. Can be repositioned several times without loss of adhesion. Available in 3", 4", and 6" widths (only 4" and 6" are normally kept in stock). To achieve ultimate adhesion, the bonding surface should be dry, clean and free of dirt and oils. The strength of the adhesive bond is dependant on the amount of surface area directly contacting the adhesive. Firm Pressure is recommended to obtain good adhesive to surface contact.